We respect nature when we make our ceramic tiles, monitoring any potentially negative impact that our processes may have on the environment, reducing it to the bare minimum whilst boosting any positive effects in a sustainable direction. Reducing consumption, using alternative energy sources, recycling materials, using less raw materials: these are just some of the actions we have implemented in order to improve the energy efficiency and the superior looks of our ceramics. At Coem, respecting nature is synonymous with our ongoing commitment to monitoring any negative impact caused by the processes we use to manufacture our eco-sustainable ceramic tiles, reducing it to the bare minimum whilst boosting any positive effects on the environment. 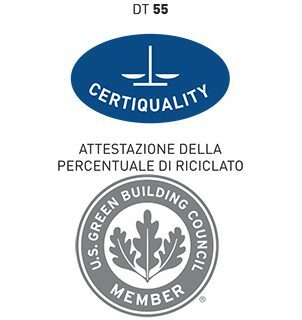 LEED® certification (Leadership in Energy and Environmental Design) assesses and certifies the sustainability of a building overall, from the design stage to its final use, using a method that assigns points to the building based on its compliance with several requisites. The technical and structural characteristics of many Ceramiche Coem products can help buildings improve their rating based on LEED® parameters. Content of recycled material, with percentages varying between 20% and 40%. Basically zero VOC (Volatile Organic Compound) emission: contaminating volatile organic compounds capable of irritating the respiratory tract. Excellent sun reflectance performance, reducing the “heat block” effect and lowering any impact on habitat and microclimate. Use of locally-sourced raw materials, leading to a considerable reduction in the CO2 emitted during its transport. Ceramiche Coem initially started to focus its attention on issues relating to the environment and energy saving in 1999. Our production process was already sustainable at that time because we use a “closed loop” system: all of the raw materials and water used during the production cycle are recycled and any waste heat is recovered, reducing consumption and CO2 emissions. Today, we can proudly say that all our production premises are ISO 14001:2015 and EMAS certified, initials that stand for Eco-Management and Audit Scheme, the most selective environmental certification of processes at European level. EMAS is an elective tool created by the EEC whose main purpose is to help create sustainable development of the economy by putting the focus on the role and responsibilities of businesses.